Kids face educational challenges every day. Rick Rieder 83B and Graduation Generation help them succeed. Emory Graduation Generation volunteer students prove that classroom experiences can be rewarding and fun for everyone involved. Rick Rieder 83B supports Graduation Generation, a community partnership for education co-led by Emory’s Center for Community Partnerships. For many students, programming for Graduation Generation has provided them with the incentive to stay in school and excel in numerous academic areas. 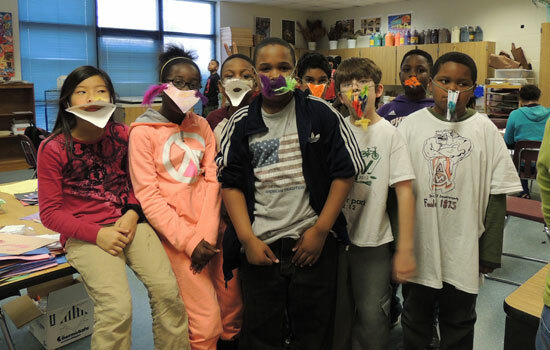 Students of the Science, Technology, Engineering and Mathematics (STEM) program wearing bird beak masks they created for class. Mentorship is an important factor in Graduation Generation’s success with teaching Kingian Nonviolence Program principles. 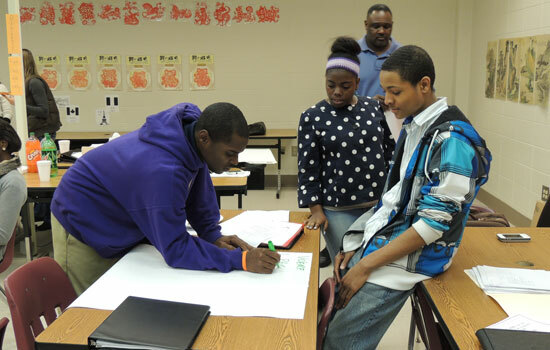 Engaged learning becomes hands-on for students of Maynard Holbrook Jackson High School. School success and graduation rates depend on many factors such as availability of educational resources, extent of parental and teacher involvement, consistency in both attendance and application, and individual determination. 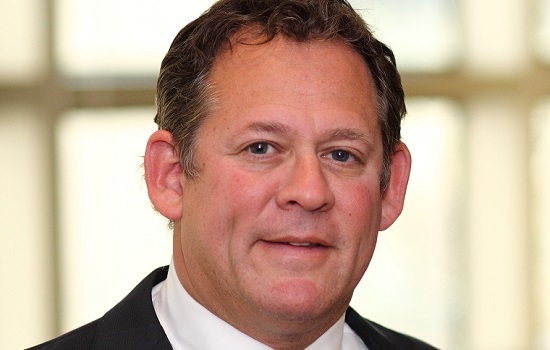 Rick Rieder 83B, Emory Board of Trustees member and chief investment officer and co-head of fixed income at BlackRock, Inc., understands that a child with a challenging home environment might need even more support to achieve ultimate educational, social, and health success. Rieder pledged $1 million during Campaign Emory to support the work of Emory’s Center for Community Partnerships (CFCP), in partnership with Communities in Schools of Atlanta, to help improve academic achievement and graduation rates in the Atlanta Public Schools. 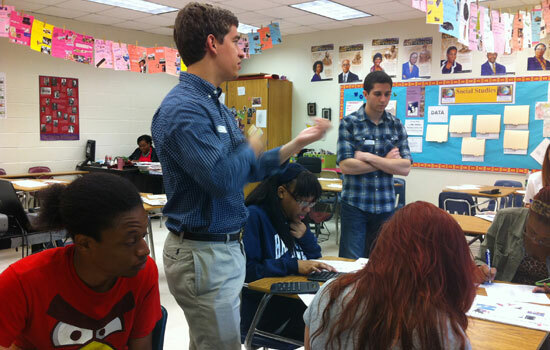 Called “Graduation Generation Atlanta,” this collaborative family-school-university-community partnership in the Coan-Jackson Cluster has engaged with more than a dozen community and philanthropic organizations, including the Zeist Foundation and the Whitefoord Community Program, both organizations with long-standing ties to Emory. Now, with effective K-12 programming established and three full-time staff members, the potential for urban educational improvement is promising. In the first two years of operation, Graduation Generation has offered a program that is holistic and addresses issues ranging from violence prevention to providing summer enrichment opportunities that nurture the whole child (camps focused on academics, arts, sports). The program initiated in the Jackson-Coan cluster in the Edgewood, Kirkwood, and Eastlake neighborhoods of East Atlanta. In this area, approximately 90 percent of students are eligible for free or reduced-price lunch. Building on its base at Sammye E. Coan Middle School, the program has expanded operations to King Middle School and Maynard Holbrook Jackson High School. Progress to date has already been very encouraging. Absenteeism and disciplinary problems, two leading at-risk indicators of school dropout, declined in Coan Middle School last year, the first full year of Graduation Generation activities in the school. At Emory, program numbers are staggering. More than 200 Emory people – including five faculty members, 40 staff members, and 150 students – worked with more than 500 Jackson-Coan Cluster students. Emory professors contributed more than 300 hours to design and implement three new courses. Graduate students from Emory’s Center for Science Education spent 1,800 hours with Coan teachers to incorporate problem-based learning into one-third of middle school classes. University students tutored 200 Coan students to reinforce learning and prepare for adequate yearly progress (AYP) testing, and tutored more than 300 elementary and middle students in reading. 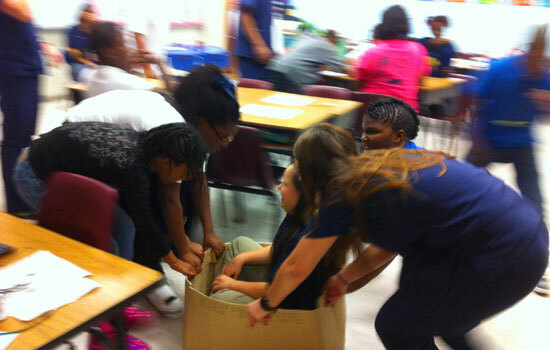 Emory students and staff worked with more than 60 elementary students in Science, Technology, Engineering, and Mathematics (STEM) club activities and with twenty Jackson High School students to teach Kingian Nonviolence Principles. “Improving the quality and reputation of the local public schools will be an essential element of retaining these families and encouraging them to enroll their children in the cluster schools,” says Bevin Carpenter Sr., Graduation Generation’s community partnerships manager. As chief investment officer and co-head of fixed income at BlackRock, Inc., Rieder’s leadership has earned him many professional accolades. He has been hailed as a visionary in his field. Rieder was inducted to the FIASI Hall of Fame at a ceremony held in New York City. FIASI, which sponsors the Hall of Fame, is a not-for-profit professional organization dedicated to the education of its membership and the fixed income community at large. FIASI serves its members by sponsoring educational programs and workshops covering topics of current interest and presented by distinguished industry leaders. Board of Trustee member Rick Rieder 83B worked with Goizueta Business School to establish the Investment fund for teaching financial literacy for kids in Atlanta. He has served on numerous Emory finance and investment committees as well as the Dean’s Advisory Council. In 2005, he was honored with Goizueta School of Business Distinguished Achievement Award. Last year, he was named a Notable Alumnus for his work with BlackRock. He is married to Debra Lieb Rieder 85B. They have two daughters – Danielle and Melanie Rieder 15B. Serving Emory comes naturally to our dedicated alumni leaders. Emory faculty and staff give generously to university programs that inspire every day. His Holiness the XIV Dalai Lama will engage Emory on ethics, education, and citizenship. Emory alumni chapters rally to raise funds for student scholarship during Campaign Emory. Giving from the heart can be deeply rewarding, and Joni Winston's gift to Emory-Tibet Partnership broadens our intellectual possibilities.